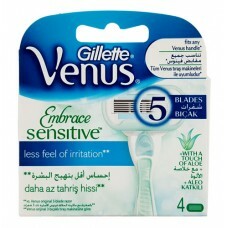 Gillette Venus Embrace Sensitive women's razor blades are a perfect match for sensitive skin. Venus Embrace Sensitive features 5 blades, spaced closely together, with reduced pressure per blade for a closer shave with less irritation. Pivoting head adjusts to curves and fits easily into hard-to-shave areas. A protective ribbon of moisture with a touch of Aloe and 8 times more glide boosters provide a smooth glide and SoftGrip handle gives great control, even in wet conditions.